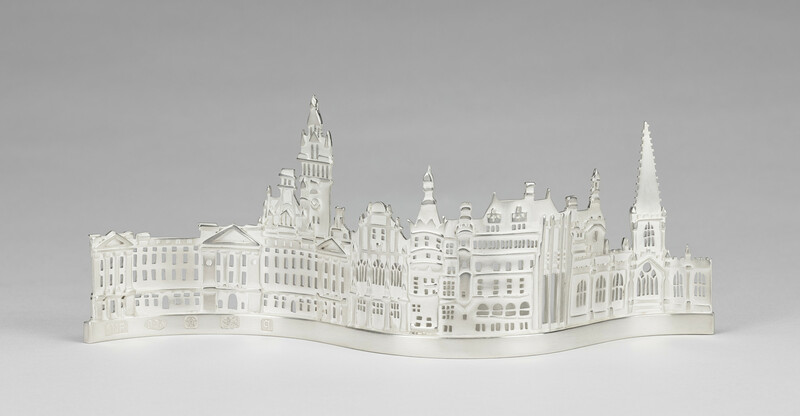 This tealight holder shows a condensed silhouette of the historic buildings in the city of Sheffield, for centuries a centre for metalwork including cutlery and silver. A tealight placed in the holder at the back would shine its light through the spaces created for windows and doors. This particular piece was created by hand sawing. The silver is hallmarked with the usual British standards, and a rose, the symbol of Yorkshire and of the Sheffield Assay Office.